Those of you who feel that Mozart's finest accomplishments can be found in his work for chamber ensemble can join me in rejoicing over this disc. Vividly recorded and beautifully played, there is at least another disc of these Hummel arrangements coming from Naxos, and I can only say that I can't wait. Hummel doesn't try to reinvent the wheel, and much like Mahler with Schumann years later, is chiefly concerned with dynamics and phrasing. The results are startlingly effective, as Mozart's music gains both an intimacy and immediacy with smaller forces. The drama is heightened, and the underlying tension that would dominate the Romantic period is even more evident than before. Of course, it helps that the original music is so strong. Even those of us who aren't musicians can instantly recognize the theme of the "Great G minor", Mozart's 40th and most popular Symphony. All of Mozart's late work anticipates an era that he would not live to see. Hummel – in my view – effectively understands what made his former teacher so great. He doesn't try to make Mozart sound like Beethoven, but lets the music speak for itself. Sure, as I already said, the added accents and details do give a graver and darker feel in places. But it still sounds like Mozart, which is a testament to both Hummel's compositional skill and his devotion to Mozart. Everything simply works. None of this would matter if the performers weren't so consistently satisfying, and happily they are all superb. All of these musicians are both capable soloists and outstanding chamber players, and they understand this music as well as anyone. They are also committed to diverse and unusual repertoire, which makes them ideal for this kind of project. They play with obvious delight, whether in the playful exchanges of K. 504's Finale (far clearer and more soundly articulated than most orchestral readings), or the quicksilver runs in the Finale of Symphony #40. Mind you, some of the weight that makes late Mozart so special is lost in the chamber music setting, but enough of it remains to demonstrate how revolutionary this music was. 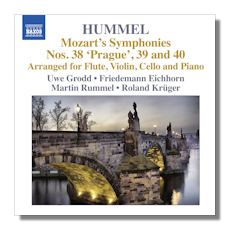 This is as much a tribute to Hummel as to Mozart, and is an exceptional disc by any standard.